In October 2015 a delegation of artists from London Collective YouPress went out to Bosnia on the Lessons from Srebrenica programme. This video documents their journey and features interview footage with our Bosnian in-country Coordinator, Resad Trbonja. 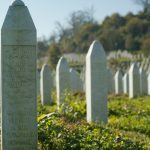 Children at schools in Berkshire will get the opportunity to hear first-hand testimony from a survivor of the Srebrenica genocide next week. The You Press collective group of artists were deeply inspired by Srebrenica to create work about human rights and war, with many pieces drawn from survivors’ accounts of the genocide in Bosnia. This event featured performances of this work and drew a diverse crowd to learn more about Srebrenica.